Most of us, including non-scientists, have a basic knowledge of the laws of motion. We observe this every day, when we throw a ball to our child or drive our car down the street. We all understand that if we push something, it moves away from us. Whether or not we know that this is called Newton’s Second Law of Motion is irrelevant because the matter will continue to behave in this way regardless. We never tend to think of matter as having positive and negative mass and as a result, we tend to think of all matter as behaving in the same way. When we delve a little deeper though, we find it is in fact possible to create matter that defies convention. What scientists at Washington State University have created is something truly bizarre, known as ‘negative mass.’ In this case, when pushed, instead of accelerating away from the force as we would expect, the object actually moves towards the force. Involved in the team was Michael Forbes, an Assistant Professor of Physics and Astronomy at Washington State University and also an Affiliate Assistant Professor of the University of Washington. Forbes explained that this process of negative mass is extremely rare, particularly in a relatively stable form. 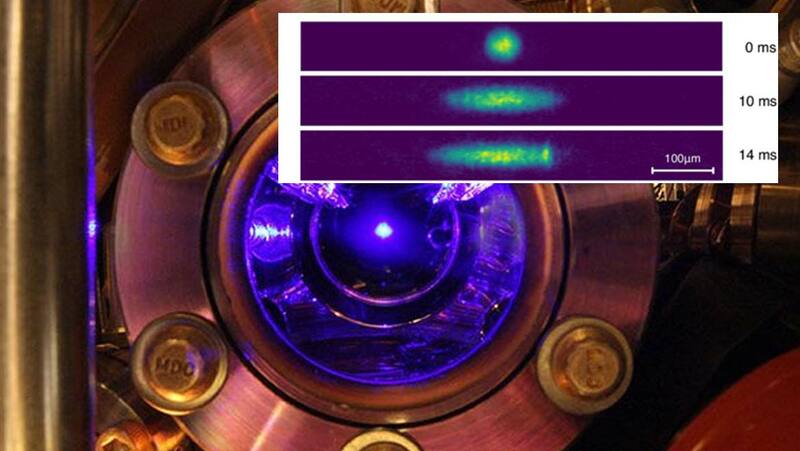 The research, published in the journal Physical Review Letters, explains that in order to achieve the elusive state of negative mass, the team used something which is called a Bose-Einstein condensate. This state was first theorized as early as 1924, by none other than, of course, Albert Einstein and Satyendra Nath Bose. In this state, atoms are cooled to nearly absolute zero. The atoms of choice for Forbes and his team were rubidium. Once super cooled, the rubidium atoms travel extremely slowly, eventually forming something which is known as a superfluid. The superfluid flows without losing any energy and also behaves like a wave. Next, the team, which includes Peter Engels, Professor of Physics and Astronomy at Washington State University, used lasers to slow the particles down. This also had the effect of making them colder. Any particles which did not follow this pattern and remained hot were allowed to escape, which also cooled the remaining matter even further. This new level of control means that researchers can now use this technique to study negative mass in more detail, but also to potentially provide us with a greater insight into other phenomena including black holes, dark matter and neutron stars.